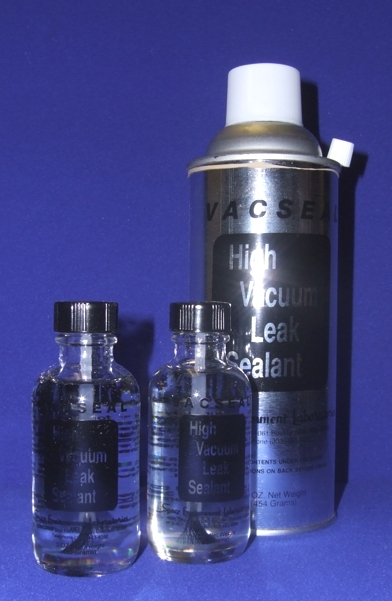 VACSEAL® High vaccum and UHV, supplied in a 2oz bottle & Aerosol Can is a silicone resin used primarily for sealing leaks in high and ultra high vacuum systems. At 50°C the weight loss after 175 hours in vacuum is only 0.000005 Grams/cm2, compared to 0.01 Grams/cm2 for epoxy compounds. Residual gas analysis indicates no evidence of hydrocarbons or other contamination arising from VACSEAL used on systems capable of attaining ultimate pressures of 1 x 1012 torr. VACSEAL® will seal leaks as large as 4 micron liters per second on systems under evacuation. The sealant will repair larger leaks if the system is at atmospheric pressure. The vapor pressure of the sealant is highest when initially sprayed or painted on the system. The vapor pressure can be reduced to nearly that of most metals by simply curing with a modest amount of heat. Recommended cure times are 30 minutes at 200°C, 15 minutes at 250°C. Curing can also be effected at room temperature but requires a period of several days. VACSEAL® is extremely useful as a cement for sealing all kinds of optical windows and CRT glass to wire feedthroughs. It will substantially reduce the IR reflectivity of metals and will produce higher emissivity levels for better heat transfer. VACSEAL® has expansive application as an adhesive at cryogenic temperatures as well as good radiation resistance. The sealant\'s durability will survive the environment of space without adverse effect on the product or the spacecraft itself. Available in both aerosol cans and bottles VACSEAL® jan withstand repeated temperature cycling from liquid helium temperatures to 450°C over long intervals of time. The curves in the graphs show the weight losses versus time at 50 and 100°C for several commonly used materials in vacuum. Samples were placed in a thermal chamber at a pressure of less than 5 x 106torr and at the temperature indicated. The silicone resin used in VACSEAL had a lower weight loss in vacuum than any other material tested. Indications of how well VACSEAL® can effect a permanent seal in vacuum systems has been demonstrated repeatedly on systems capable of attaining ultimate pressures of below 1 x 10-12 torr even after being baked at temperatures above 450 C.
Prior to using the sealant, surface dirt should be removed from the suspected area. Any hydrocarbon solvent is recommended for removal of greasy surface dirt. New systems can be sprayed or painted directly. In event it is desirable to remove the sealant, cured sealant is easily removed with any acetate, ketone, or ester solvent. The uncured sealant can be removed by wiping with any standard hydrocarbon solvent.